Stephanie Simoni is Leaving KATV 7 to go to New Haven Conn to work for WTHN Their ABC Affiliate she said this Morning she Wanted to be Closer to her Mom in Mass. HERE's an interesting article from Digital Facility all about the new FULL Hi-def studio Texarkana, Texas High School has invested in. Some might not be willing to admit the equipment the school has is much more up to date than some of the Shreveport news station's. KTHV/Channel 11/Little Rock has added an additional Meteorologist to its lineup. Sarah Fortner has joined the staff and was introduced last week to viewers. Fortner comes to Little Rock from WHIZ-TV in Zanesville, Ohio. 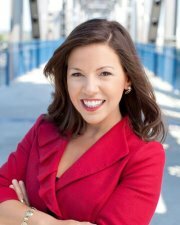 TV Spy reports Dawn Dugle has exited KHBS/KHOG. Dugle joined the Northwest Arkansas station in early 2010 as News Director. KHBS/KHOG VP and GM Brian Sather would not comment to TV Spy about her departure. What's going on at KTBS in Shreveport? They have new job postings for a Weekend Anchor/Producer/Reporter. Does this mean Judy Wagoner, formerly of KNOE in Monroe, is leaving as the current Weekend Anchor? There is also an opening for a Sports Anchor/Reporter. Does this mean Fletch is leaving KTBS after all these years? “Nexstar’s continued leadership in new business development resulted in a 7.8% rise in first quarter core local and national revenue inclusive of a 5.0% first quarter increase in local spot revenue and a 15.6% rise in national spot revenue. The 2012 first quarter marks the sixth sequential increase in our quarterly core revenue growth rate and our tenth consecutive quarter of core television advertising revenue growth. While we look forward to the benefit of growing political advertising activity throughout 2012, Nexstar’s gross revenue growth in the first quarter excluding political was a robust 16.3% inclusive of a 9% rise in automotive category ad spending. “Strong gains in our core television operations were complemented by the expected significant double digit growth in first quarter retransmission fee revenue which rose 70.2% to $14.5 million, a record level of quarterly revenue from this source. With the renewal of more than 130 retransmission consent agreements in 2011 we project significant revenue growth from this source throughout the year. Double digit revenue growth also continues in our e-Media operations which posted a 12.5% increase in revenues to $4.1 million, representing our twenty first consecutive period of revenue growth for the Company’s community web portal strategy. Similarly, we expect to extend our e-Media revenue growth throughout 2012 as we benefit from a full year’s contribution from Internet technology provider GoLocal.Biz which was acquired mid-2011 in an accretive transaction, as well as our expanded mobile offerings which bring local advertisers new marketing solutions that yield high interactivity and ROI. KFSM Planning to "Tell Better Stories About Local Sports"
In an e-mail, KFSM news director Rick Bagley said that while he cannot comment on personnel issues, the station is "reorganizing its sports department to focus on better storytelling of local athletes and all local sports." "We are not ending sports coverage," Bagley continued in the e-mail. "Our plan is to tell better stories about all local sports, including the Arkansas Razorbacks. Sports is and will continue to be an important part of our product on-air and online." 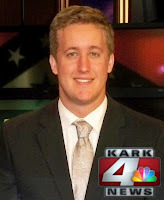 This from the KARK Facebook page: KARK 4 Welcomes new reporter Josh Berry. He comes to Arkansas from KTAB-TV in Abilene, Texas, where he was an anchor and reporter. Josh grew up in Arlington, Texas but attended college in Arkansas at Henderson State University in Arkadelphia. You'll see him on the air tonight at 5:00. KFSM's Sport's Director John Engleman was let go by the station last Friday. They did not renew his contract and did not tell him until Friday afternoon according to the tweeter account of the Times Record's sports editor Scott Faldon. @scottfaldon. He also posted today a "Q: Would you watch a local newscast that didn't include sports? Because that might be an option in Fort Smith/Fayetteville before too long."